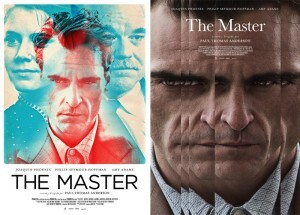 Paul Thomas Anderson’s, ‘The Master’ was the second film Aliens & Others watched and discussed on Saturday. The association of the subject matter with Scientology attracted a lot of media attention to the film, but we thought the themes of the movie were less about that organization and more about dysfunctional relationships in general. The story follows Freddie (Joaquin Phoenix), an isolated, socially dysfunctional war veteran with PTSD. While drifting, he boards the yacht of the leader of “The Cause”, Lancaster Dodd (Philip Seymour Hoffman). Scientology is alluded to as “The Cause” with Dodd being a reference to Ron Hubbard. Lancaster takes a shine to Freddie and embraces him into his social network and the “processing” techniques of his philosophical cult-like organization; here, people are repetitively questioned to process old traumas. The film follows this relationship of a needy, vulnerable man and a controller, the latter revealing this quality to stem from his own neediness. We discussed how the title, “The Master” was misleading as the story left us asking at times, which one of them was the Master of whom, as that status changed throughout the story. While Freddie ends up choosing freedom over connection, by leaving “The Cause” and Lancaster Dodd, Dodd becomes more dependent on Freddie, alluding to a possible romantic obsession. The film was beautifully shot and masterfully acted, especially by Joaquin Phoenix. The story was difficult to decipher initially, but in the end, we decided it was a story about dysfunctional relationships and the choices we have to stay or leave. This entry was posted in Blog and tagged Aliens & Others, Dysfunction, Film, Film club, Joaquin Phoenix, Review, Scientology, THe Master. Bookmark the permalink.